For the first time, all this information is available in an online service. Tutkihankintoja.fi improves transparency in the use of public funds and provides information on the market to companies. Since the site’s publication in September 2017, Tutkihankintoja.fi has received a significant amount of positive feedback from citizens, different governmental organisations, private companies and media. 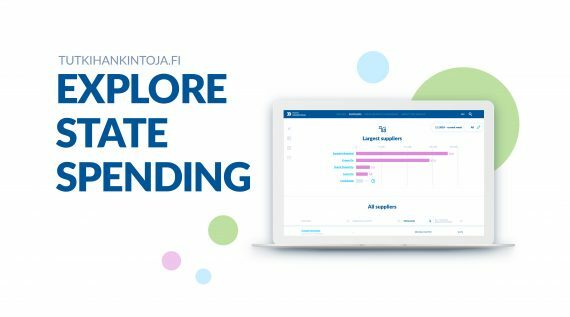 For governmental organisations, the biggest advantage of Tutkihankintoja.fi is that all information is now easily accessible on one website. Earlier, the information on state spending was scattered and accessible only by request. This improvement has been welcomed with open arms. Some governmental users of the service have pointed out that it is easier to study their own spending from Tutkihankintoja.fi than it is from their own internal systems. Users have also credited Tutkihankintoja.fi for the possibility to generate comprehensive general views from different perspectives. For example, it is possible to study who are the biggest suppliers of the government, and how much has been bought from them on a particular time period. The possibility to track procurements down to the invoice level has been used actively. The average visit duration on Tutkihankintoja.fi is 3 minutes and 35 seconds, and on average, a visitor clicks through 5,15 pages on one visit. These analytics suggest that visitors are able to utilize the analyzing tools the site offers and benefit from its contents. Tutkihankintoja.fi has also drawn attention from different third sector agents, such as Open Contracting Partnership and Open Knowledge Finland. In fact, Open Knowledge Finland awarded Tutkihankintoja.fi with the “Avoimuuden sydän” (Heart of Openness) award in December 2017. They named Tutkihankintoja.fi as the most ambitious open data achievement of the year, and credited the service for its innovative vision and aim to make public procurement more open, fair and ethical. Tutkihankintoja.fi has been presented abroad in several occasions by civil servants of the government and has received appreciation and curiosity. Some organizations have contacted Hansel afterwards to be able to hear more about the service and about the process how this was made possible in Finland. One of these occasions was an OECD meeting in October 16, 2017 under the theme “Measuring Procurement Impact – Implementing Metrics to Measure the Contribution of Public Procurement”. In the end of August 2017, a few weeks before Tutkihankintoja.fi -service was officially launched, it was introduced to the citizens as a part of an open administration (Avoimet ovet) event. The event was organized in several governmental agencies simultaneously and as a part of Finland’s 100 years of independence celebration. The prime minister of Finland, Juha Sipilä, visited the Tutkihankintoja.fi -stand and took a moment to study the websites data.